Laci Szabo is a knife and self-defence tool designer who has an extensive experience in Law Enforcement and the Military and has also studied martial arts with some of today’s most well-known instructors. He has a unique style, and his designs are instantly recognizable to those that are familiar with his pieces. Here’s more about Laci Szabo’s Design Philosophy, and read further for the review of his latest knife from Spyderco. 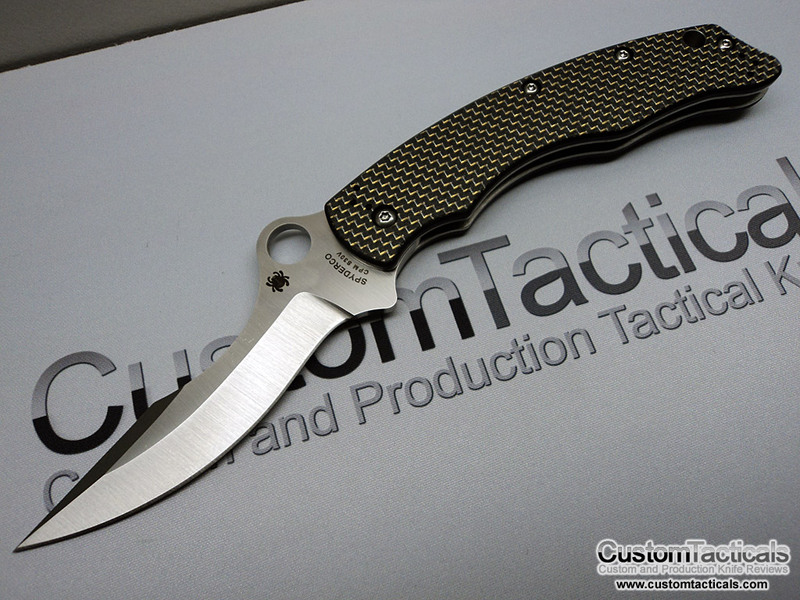 This is one of the Taichung Taiwan made Spydercos that features American CPM-S30V steel in its construction. Following in the footsteps of the Gayle Bradley, the Chokwe and several others, the Laci Szabo folder is also well-constructed, and from what I can tell.. those Taiwanese manufacturers are just getting better and better. The blade is precision hollow ground CPM-S30V stainless steel, with a big belly and trailing point profile that screams Laci Szabo. There is a small swedge on the top of the blade that gives the tip better penetration and a cool looking profile as well. The blade is thicker than most, and also very long, measuring a whopping 4.6″ in length. This knife screams business when you whip it out with a very intimidating blade profile… not an ideal EDC unless you’re military or LE maybe. This will scare any sheeple within visible range. Awesome handle profile, also classic Szabo. 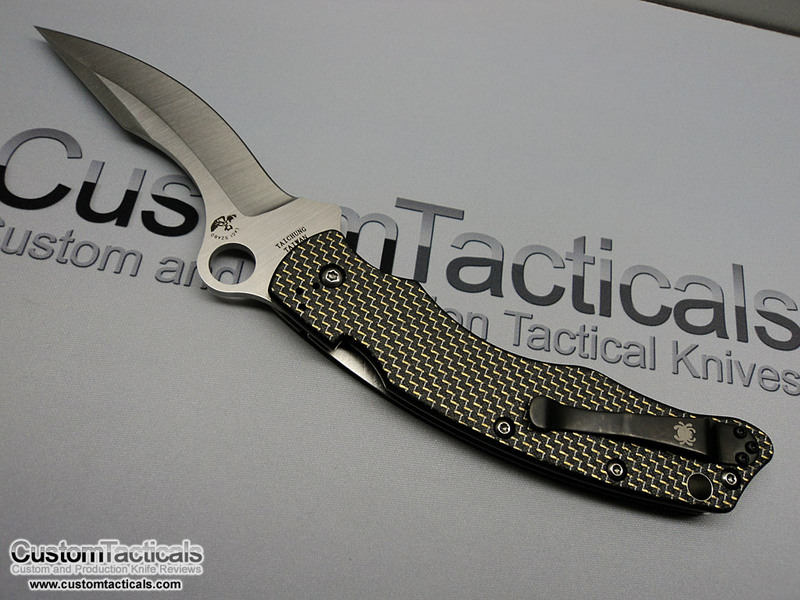 The Gold Line Carbon Fiber is beautiful, yet tactical looking, and gives “boring” old carbon fiber a bit of pizzazz. Spyderco has a tendancy to finish Carbon Fiber with a rough and unflattering finish, rather than polishing it down like Custom Makers do. 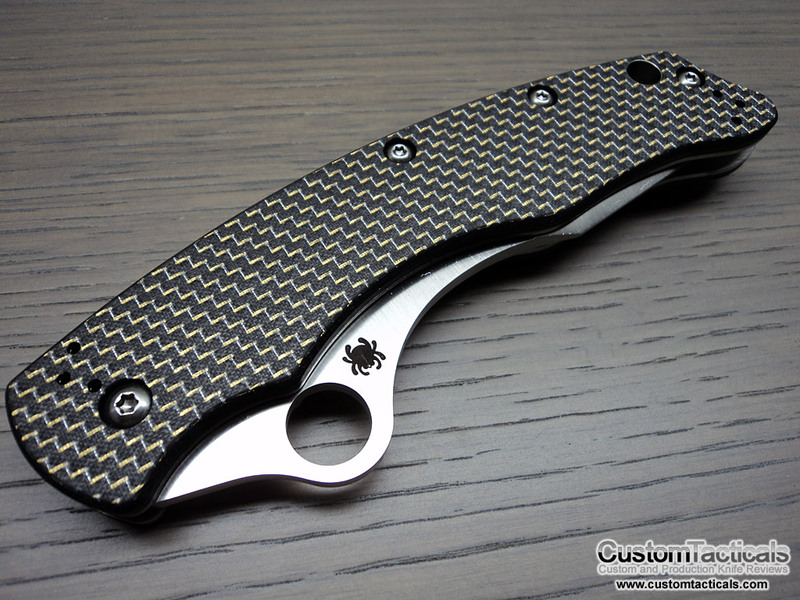 With the Gold Line Carbon Fiber, it doesn’t look as unfinished the way regular Spyderco Carbon Fiber does… and that is a positive point with this one. Please Spyderco, give us some nicely finished G-10!! Ergonomics are fantastic. Its a big knife, and definately a lot of knife for my smaller paws, but I get good purchase with the grip on the scales along with the curved handle shape. I enjoy holding this one.. it makes me feel like a ninja. Superb job from Taichung Taiwan. I still feel like they could have tried going thinner on the pivot washers for a snugger fit, but they did great with what they used here. Awesome grind lines on the blade, no imperfections that I could see. Excellent handle finish and the Compression Lock is solid solid solid. I really like the compression lock. Next to the Liner lock, I think the compression lock is my favourite locking method for folders. Spyderco did a bang-up job with it, and its just amazingly strong… but then Spyderco always does a good job with their locks. They never let the looks get in the way of functionality. This thing rocks. I couldn’t help myself when I saw it.. I just had to buy it. Not many production knives do that to me, but when I got a chance to handle this thing at the store, I had to take it home with me. Partly due to the massive 4.6″ blade, partly due to the smooth and solid construction, and partly due to the superb lock-up.. this thing just ticks all the right boxes for me and makes it a have-to-own blade in my books.